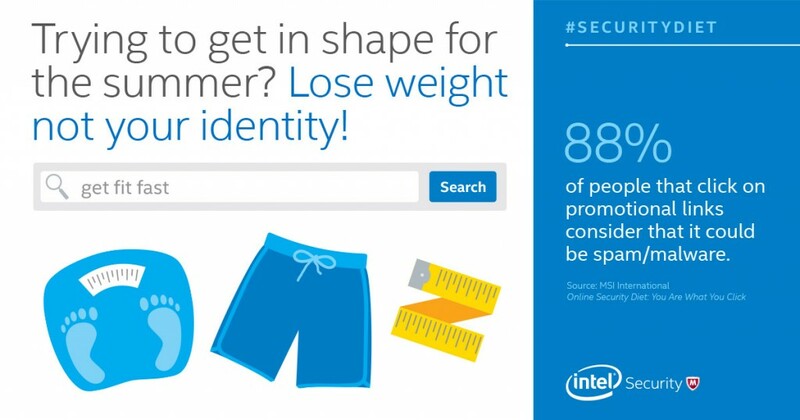 • Timed with summer holiday season, Intel Security conducted a study to understand consumer behaviors when searching online for diet and fitness programs, and to help educate them about potential risks. • The study highlights various ways cybercriminals take advantage of the public’s interest in dieting programs, and focuses on what behaviors consumers engage in that may open them up to online security dangers. SANTA CLARA, Calif., May 17, 2016 – Intel Security today released findings from its new study, “Online Security Diet: You Are What You Click,” which examines the online behaviors and attitudes of Americans ages 21 to 54 toward dieting clickbait. The research revealed that when it comes to the desire for the ideal body, people may be willing to sacrifice their online security if it takes them a step closer to achieving desired results. With the summer season approaching, May is a popular month to start a new diet routine, and people are turning online for quick solutions. Thanks to better weather, more hours of sunlight and planned vacations, consumers have more opportunities to be active, which kick-starts a new wave of diets long after New Year’s resolutions come to an end. Dieting Promotions: Too Good to be True? • 61 percent of survey respondents have clicked on a promotional link that offers a diet program. • 57 percent of survey respondents would most likely click on a promotional link for a diet program before the summer. • 37 percent of respondents are more likely to click on a promotional link or an article offering dietary tips featuring or endorsed by a celebrity. • 30 percent of survey respondents have purchased a service or product from a promotional link without knowing whether or not it’s a secure site. • Almost half of respondents would be likely to click on a promotional link for diet programs generated by a Google* search (47 percent), with others reporting they would click links featured on Facebook* (42 percent), a website (31 percent), or within an app that they already use (28 percent). • Many respondents report they are willing to share information like email address (65 percent), full name (51 percent) or age (50 percent) with a website, service or company in hopes of reaching their goal weight or dream body. • Yet 35 percent of respondents don’t know how to check if a website is secure before providing payment details or personal information. • Click with caution. Offers from sites that seem too good to be true, such as “Lose 10 pounds in one week,” may indicate that a site should be viewed with caution. Websites or emails might include phishing links that can lead you to websites that lure you into giving personal information to cybercriminals or download malware to your computer. • Browse safely. Beware of phony websites. Sites aimed at scamming consumers may have an address very similar to a legitimate site, like “Wait Watchers” opposed to “Weight Watchers.” Phony sites often have misspellings, poor grammar or low-resolution images. If a site asks for personal information, double check the URL, and make sure it’s the site you intended to visit and not an imposter. Use a web reputation tool such as McAfee WebAdvisor that can help identify risky sites and inform you that you may be about to visit one. • Develop strong passwords. Do away with the “123321” password, and use a strong one, like “9&4yiw2pyqx#.” Regularly change passwords and don’t use the same passwords across all your accounts. As a way to improve the quality of your passwords, consider using a password manager. • Stay up to date. The best security software updates automatically to protect your computer. Use the manufacturer’s latest operating systems and allow security patches to be updated on an ongoing basis. Also ensure you have the appropriate software set to conduct routine scans. • Use a comprehensive security solution. Protecting all your devices with a comprehensive security solution, like McAfee LiveSafe, can help shield you from malware and other cyberattacks. You can also visit the Intel Security Facebook page at facebook.com/intelsecurity and McAfee Security Advice Center for information on the latest consumer threats and tips for living safer online. In April 2016, Intel Security commissioned MSI International to conduct an online global study among 15,000 consumers between the ages of 21 to 54, evenly split among age and gender.